Understanding fit is a crucial part of running a successful fashion business. It can lead to product development efficiencies and also trust with both the wholesale and retail customer. On the other end, it's the number one reason for returns and could mean serious implications for your brand. Our next Meetup with Alvanon and Carrie Parry is to help fashion designers understand the fundamentals of fit. This includes basic terminology, tools for success and things to think about when creating a fashion line. A conversation with Alvanon’s Don Howard, Executive Director, AlvaInsight and fashion designer Carrie Parry, the recipient of their two-year mentorship program will be moderated by Melissa Hall of The Emerging Designer to help attendees to learn these basics. What is Fit and why is it so Important? 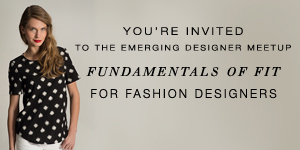 RSVP for the event on The Emerging Designer Meetup page.